Yeah, I think you got all of what Phil was teaching in the video. It's good that you apply a specific work at the range. That's the way we all should do it, but that's if we want to learn something from a lesson or a search. Anyway, yeah, I like being on the left on chips, pitches, mid shot... all the way to full shot except with the putter. I'll be 62 in a few months. I wish I did this when I was young or right from when I started golf. Many of the guys at my old club who I hung with plays it this way in all different levels. One kid is at +4, my index is 10.3 and a few other... some are complete beginners. It's amazing to play this way. Nice topic, HJJ003, and glad to hear you enjoyed playing your replica course. Imho replica or homage courses are fun to try and play, but I'm not much for seeking the top courses in the world because I know my limitations (but I would like to if the timing is right) so I don't travel often and I haven't played much of the great originals and neither of the replicas/homage because maybe I don't want to be teased by it (?) I've had a chance to play a couple and the two replica courses I have played were the Royal Links Golf Club and Bears Best, both of them were in Las Vegas Nevada. It took me a while to play them and when my group decided to play there, it wasn't my choice, although I ended up really liking them for what they are. We played them at different times in the summer months. It was a good experience to play the popular holes seen at The Open from the Royal Links. The composition of holes on this course flows well, I think, and it played pretty tough also, and I loved how they've copied the greens although I don't have a clue what to compare it to, but it was very good and challenging. Bear's was a good course as it is- but not a great one. I didn't feel the flow of its course as a whole, I can't place or have the lack of words for it. Most every hole has a very different feel to it, but nevertheless, we enjoyed for what it is- scoring was easier here than the royal links as for comparison. For a homage course, I was fortunate enough to visit Ireland, they have a hotel & resort called Druids who maintains two courses, Druids Heath, and the more popular Druids Glen which had held the Irish Open for a few years shortly after it opened its doors. Many locals (at the bar- lol) tells us that it was regarded as the Augusta National of Europe. We had high expectations of this course though it was a twist from all the links courses we prepared for but it did not disappoint. The course played... wow, can I just say "wow!" I mean, if the golf gods punished me and said I am to be restricted to play only one course for the rest of my life I would lobby for this. It's a great course. Wow that’s cool, Buckeyebowman! You played it for some time, how did you tun across the idea? No driver/woods? Noel Daof replied to RemyM's topic in Balls, Carts/Bags, Apparel, Gear, Etc. ^^^Good info up there. If I may add on the lie board check- the shaft can contribute to the degree of the club's lie as it flexes down- too soft a flex can suggest higher up right. About bending back- whether the head is forge or cast, most fitters do not recommend a bend back. That's when the metal begins to weaken and ultimately break. The best or proper way to go about it is of course have a professional fitting session. Trial and error can actually be fun which is what I've done initially. The draw back is that it is more time consuming although you'll learn many things (but some not so accurate) at the same time along the way- it could take years though. Also, in the long run, it is much more expensive than a fitting session. Sounds cool. How recent have you been in it and how much time and efforts are you spending on it? Anyway, Phil Mickelson has a short video out there in youtube about chips/pitches although it only has three things. The left arm, ball position, and weight. 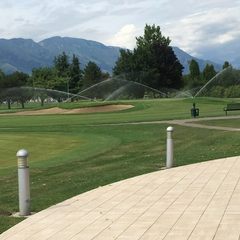 Club Car Tempo Walk: That looks really cool! I've seen that technology in a bigger scale/machine and it carries 4 bags for the foursome. I'm imagining that the topic device has some type of control for it to stop following you as needed. Anyway, other than it looks bulky to lug around from course to course, this technology looks like something I would like. I've owned a battery powered caddy for many years now- early 2000. It's low tech- on/off switch and an analog speed control. I like that it gives the caddy effect while hands free. The uphill walks are easier than with my ClicGear for sure- especially on windy days. I wish I had something like this. My 2019 goal is to consistently threaten par each time I go out. Right now, my current index is at 10.3. I've been a little lower than that before, but never really anything consistent in making par or even close to it in a consistent way. I have pared a course once on whites with a slope/rating 124/70.1 but never really scoring in the 70s much anywhere else. Once, I almost pared a course I haven't seen nor played before with a slope/rating of 137/71.5, but I don't bring it up for my own glory but it's to make a point to myself that it can be done and there are proper ingredients in a round that produces those rounds. Yeah, it was one of the best day in golf I could remember and at the end of that round was the only time I had eye contacts with my group when we shook hands and they informed me that I was one over my first round at MCC. It is those rounds that I've always wanted- probably not so much the score, but the efforts poured into it or the way the efforts were applied, but it is why I'd like to challenge myself to that goal. In a heated match over the weekend, I shot 76 on a course slope/rating 124/71. Maybe I'm still high from that round, but I've made up my mind before the New Year turned and I'm up to the challenge and logging in the work for my game. Timeline wise, I have only 4 months and 10 days left. To be clear with my goal, beginning this summer, 8 out of my 10 rounds should be close to breaking par by3 strokes on a course slope/rating 124/70 or comparable. Pressure- definitely is. Commitment- I haven't missed a beat. Nothing major, but I've been thinking of driving down to either the Palm Springs area or even San Diego for a round. Hey Guys, newbie here, and late to the party on this thread. The heading on this thread was the one that got me interested to search more. I saw a popup on my phone about it and I tried to follow it- all good read from everyone- enjoyed it- all very interesting to me... and now I'm here. Although,TST had a warning note that this thread was started in September 2010, more than 8 years ago! (Yikes!) 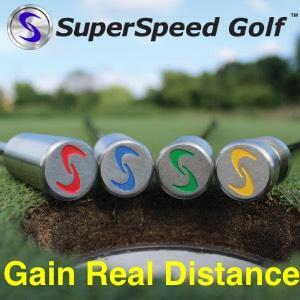 I'm still interested in it and curious wanting to know and ask if anyone still set up on their forward side on a more serious golf swing development since this thread started? Anyway, around the end of summer 2010, I met a guy and saw him regularly around the course, and we played a few holes a few times, but my game was way far from his- he was just too good and knew many aspects of the game and had been around the higher level circuit. He was all about being in your left (forward side) from start to finish of the swing. Most the topic conversations we had were big on setting up on the forward side as he leads us into it- I mean playing from your left side as your center of the swing. But then that was just a secondary part of it all. I learned and realized there were many huge differences or variations anyone w/coud do while preloading weight on the forward side. 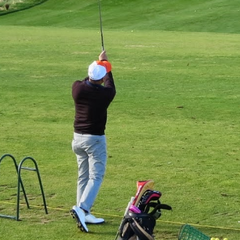 Much like any swing, it can have or should I say, it has many different variations whether it is intended. But his ideas were intriguing and before I knew it, I was tinkering with being on my left and I was learning it like a text book. Anyway, anyway, anyway... 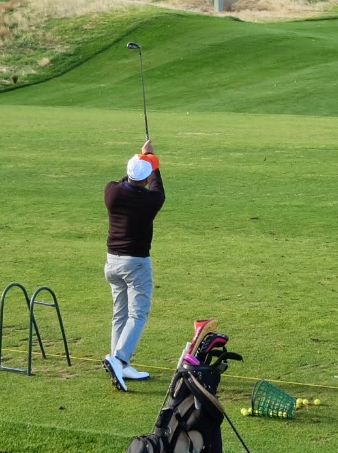 I just thought I'd reach out and be a part of the conversation about it, and have a healthy dialogue with others who have been working on a swing similar to a preloaded weight on the forward side. 'Hope the weekend games are going well!